We have presented analysis and studies in the past which showed that as long as you don’t live in a handful of countries, the true threat or risk of terrorism is not quite as high as it may be perceived by the average man or woman on the street. 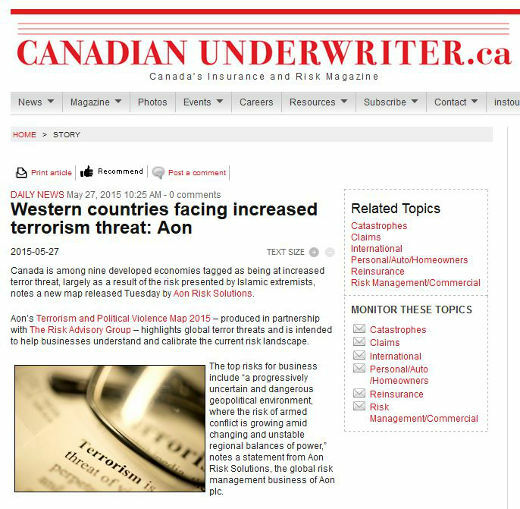 But it seems that the real world underwriters of risk in our society – insurance companies – are of a different opinion in that they see the risk of terrorism increasing in the West (one should probably expect higher rates in future insurance policies). AON does seem to combine terrorism with political violence which may be civil disobedience or domestic protests which could be significant if there are any overbearing economic or social factors. “Although the map shows a net reduction on country risk ratings worldwide – the risk rating was reduced in 21 countries and increased in 13 – Aon reports that political violence and terrorism risks is concentrating and intensifying around a smaller number of countries.